The light from the moon glistens across the surface of the water leading to the Inukshuks adorning the coastline of Churchill, Manitoba as the Aurora borealis show takes place above. The moon sits just below the line of the Aurora borealis as the green lights dance amongst the bright shining stars that fill the sky over Churchill, Manitoba. Rock formations known as Inukshuks have been created along the beach and send out a unique message as the light show is well underway. 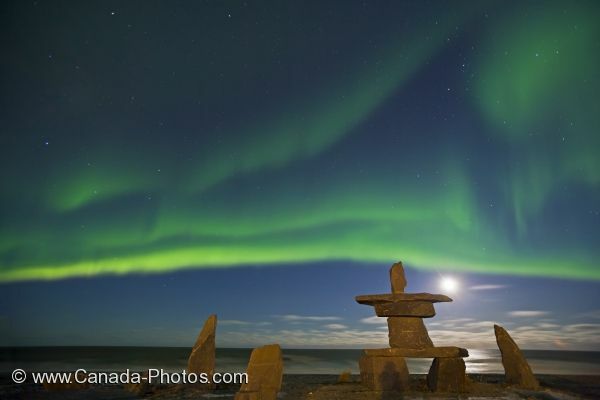 Northern Lights, Aurora borealis, above an inukshuk in the town of Churchill with a bright moon above Hudson Bay, Manitoba, Canada. Picture of the Aurora borealis or Northern Lights and their light show dancing above the moon in Churchill, Manitoba in Canada.